For diesel engines, in emergency cases where genuine products are not available, lubricants with min. performance ACEA C2 are accepted. If this is the case, the best engine performance is not guaranteed. 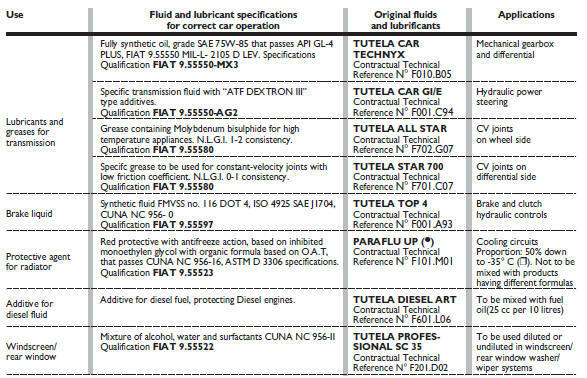 We however recommend replacing the lubricant with those recommended by Fiat Dealership. The use of products with features lower than ACEA A3 could cause engine damage which is not covered by warranty. If the vehicle is used in particularly cold climates, ask your Fiat Dealership for the right Selenia product. (●) IMPORTANT Do not add or mix with fluids with specifications other than the specified ones. (❒) When the vehicle is used under particularly harsh climate conditions, we recommend using a 60-40 mixture of PARAFLU UP and demineralised water.